The 43-Series Copper (cupric) Ion-Selective Electrode (ISE) is a general purpose, laboratory or field electrode offering affordable, low maintenance Copper (cupric) analysis performance for many water applications. Specifications: Sensor Type: Solid State Range: 0.064-6,450 ppm Sample pH Range: 2-12 Slope: 26 ± 2 mV/ decade Interferences: Hg2+, Ag+ must be absent. High levels of Fe2+, Br-, and Cl- interfere Features: ABS plastic body with sta.. The 44-Series Copper (cupric) Ion-Selective Electrode (ISE) is a general purpose, laboratory or field electrode offering affordable, refillable Copper (cupric) analysis performance for many water applications. Specifications: Sensor Type: Solid State Range: 0.064-6,450 ppm Sample pH Range: 2-12 Slope: 26 ± 2 mV/ decade Interferences: Hg2+, Ag+ must be absent. High levels of Fe2+, Br-, and Cl- interfere Features: Refillable and standard 12mm d.. The 03-Series Copper (cupric) Ion-Selective Electrode (ISE) is a general purpose, laboratory electrode offering affordable, refillable Copper (cupric) analysis performance for many water applications. Specifications: Sensor Type: Solid State Range: 0.064-6,450 ppm Sample pH Range: 2-12 Slope: 26 ± 2 mV/ decade Interferences: Hg2+, Ag+ must be absent. High levels of Fe2+, Br-, and Cl- interfere Features: Refillable and flushable reference in s.. The 12-Series Copper (cupric) Ion-Selective Electrode (ISE) is a premium laboratory or field electrode offering excellent performance and longevity in many water applications. Specifications: Sensor Type: Solid State Range: 0.064-6,450 ppm Sample pH Range: 2-12 Slope: 26 ± 2 mV/ decade Interferences: Hg2+, Ag+ must be absent. 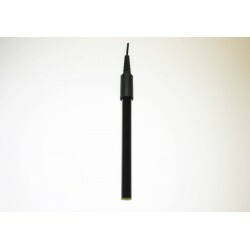 High levels of Fe2+, Br-, and Cl- interfere Features: Refillable reference, replaceable sensor modules and standard 12m.. The 43-Series Cyanide Ion-Selective Electrode (ISE) is a general purpose, laboratory or field electrode offering affordable, low maintenance Cyanide analysis performance for many water applications. Specifications: Sensor Type: Solid State Range: 0.2-260 ppm Sample pH Range: 10-14 Slope: 57 ± 2 mV/ decade Interferences: I-, Br-, Cl-, S2- must be absent Features: ABS plastic body with standard 12mm diameter and 120mm length Sealed, gel-filled .. The 44-Series Cyanide Ion-Selective Electrode (ISE) is a general purpose, laboratory or field electrode offering affordable, refillable Cyanide analysis performance for many water applications. Specifications: Sensor Type: Solid State (LaF Crystal) Range: 0.2-260 ppm Sample pH Range: 10-14 Slope: 57 ± 2 mV/ decade Interferences: I-, Br-, Cl-, S2- must be absent Features: Refillable and standard 12mm diameter and 120mm length The refillable, d.. 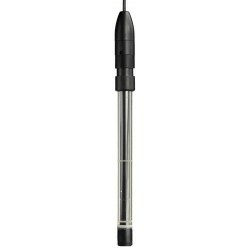 The 03-Series Cyanide Ion-Selective Electrode (ISE) is a general purpose, laboratory electrode offering affordable, refillable Cyanide analysis performance for many water applications. Specifications: Sensor Type: Solid State (LaF Crystal) Range: 0.2-260 ppm Sample pH Range: 10-14 Slope: 57 ± 2 mV/ decade Interferences: I-, Br-, Cl-, S2- must be absent Features: Refillable and flushable reference in standard 12mm diameter and 120mm length The.. The 12-Series Cyanide Ion-Selective Electrode (ISE) is a premium laboratory or field electrode offering excellent performance and longevity in many water applications. Specifications: Sensor Type: Solid State (LaF Crystal) Range: 0.2-260 ppm Sample pH Range: 10-14 Slope: 57 ± 2 mV/ decade Interferences: I-, Br-, Cl-, S2- must be absent Features: Refillable reference, replaceable sensor modules and standard 12mm diameter and 120mm length The r.. The 43-Series Fluoride Ion-Selective Electrode (ISE) is a general purpose, laboratory or field electrode offering affordable, low maintenance Fluoride analysis performance for many water applications. Specifications: Sensor Type: Solid State (LaF Crystal) Range: 0.02 to saturated Sample pH Range: 5-8 Slope: 57 ± 2 mV/ decade Interferences: OH- Features: ABS plastic body with standard 12mm diameter and 120mm length Sealed, gel-filled double-jun.. The 44-Series Fluoride Ion-Selective Electrode (ISE) is a general purpose, laboratory or field electrode offering affordable, refillable Fluoride analysis performance for many water applications. Specifications: Sensor Type: Solid State (LaF Crystal) Range: 0.02 to saturated Sample pH Range: 5-8 Slope: 57 ± 2 mV/ decade Interferences: OH- Features: Refillable and standard 12mm diameter and 120mm length The refillable, double-junction reference.. The 03-Series Fluoride Ion-Selective Electrode (ISE) is a general purpose, laboratory electrode offering affordable, refillable Fluoride analysis performance for many water applications. 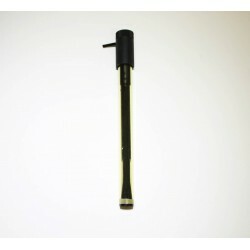 Specifications: Sensor Type: Solid State (LaF Crystal) Range: 0.02 to saturated Sample pH Range: 5-8 Slope: 57 ± 2 mV/ decade Interferences: OH- Features: Refillable and flushable reference in standard 12mm diameter and 120mm length The flushable, double-junct.. The 12-Series Fluoride Ion-Selective Electrode (ISE) is a premium laboratory or field electrode offering excellent performance and longevity in many water applications. Specifications: Sensor Type: Solid State (LaF Crystal) Range: 0.02 to saturated Sample pH Range: 5-8 Slope: 57 ± 2 mV/ decade Interferences: OH- Features: Refillable reference, replaceable sensor modules and standard 12mm diameter and 120mm length The refillable, double-junctio..